My wardrobe these days has mainly consisted of solid colored shirts, blouses, and sweaters, which leave me with a nice canvas for bold and colorful necklaces. I've been slowly purchasing more jewelry for my neck, but I also decided this would be a great opportunity for me to design some of my own! Creating the wood bead + copper necklace a while back, made me realize how much I enjoy making jewelry and lately I've had a desire to experiment with other textures and elements to construct different necklaces. Have you ever made anything with balsa wood? It's an extremely lightweight wood that's perfect for crafting, model making, and creating jewelry. 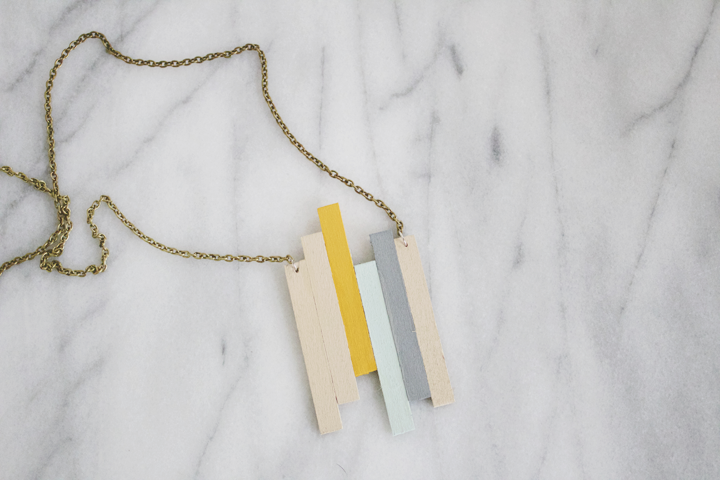 Next time you're at your local craft store, grab some and make this parallel line necklace. 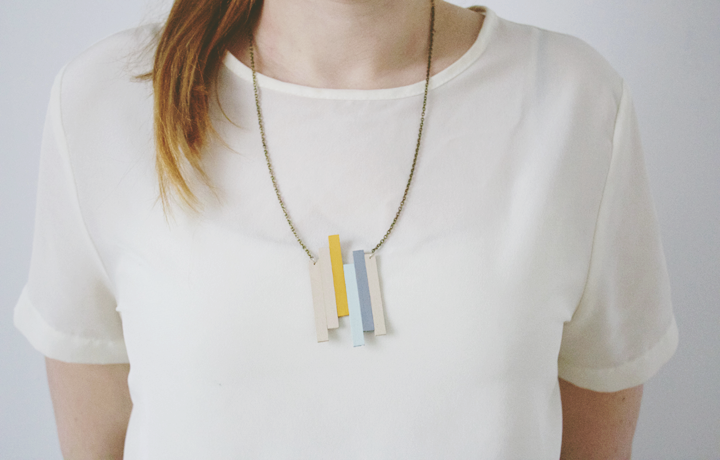 The necklace is light around your neck and makes a bold statement, even with soft tone colors like the ones I chose. Step One // Measure and cut the balsa wood strips with an exacto knife. Step Two // Paint balsa with acrylic paint. Step Three // Once the paint is dry, lay out the wood in a design you like and super glue the strips together. Step Four // Using a bead reamer, punch a hole parallel on either side of the design. for were you will be attaching the chain. Step Five // Put a jump ring through each hole and attach your jewelry chain to the rings. 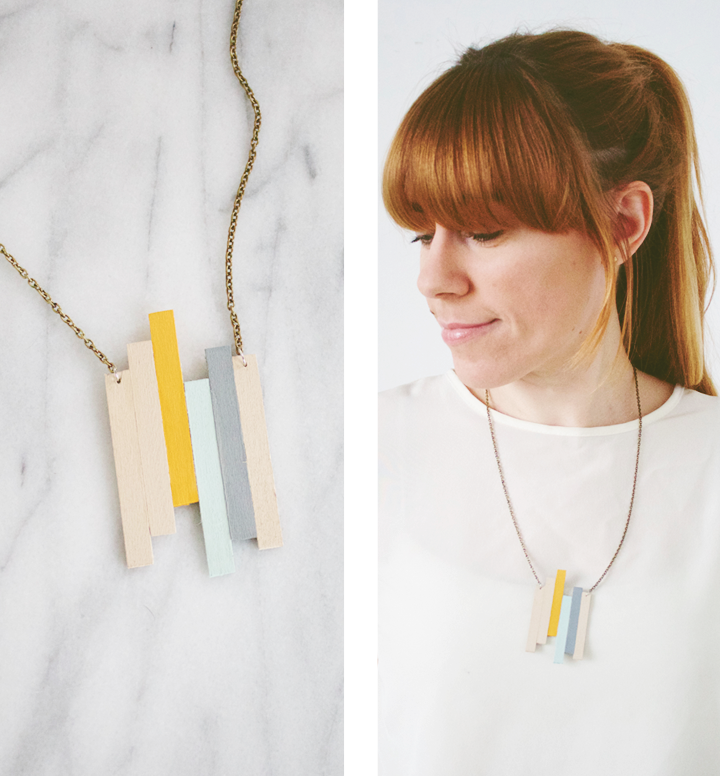 Your balsa wood necklace is ready to wear!